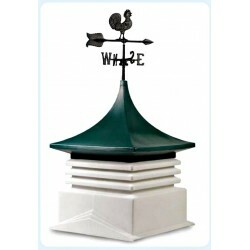 Shop our shed cupolas and weathervanes from top brand name AG-Co. Cupolas add a unique finishing touch to any barn, garage, or outbuilding and provide ventilation. Free Shipping on all orders! MODEL 22O is the most popular size and is great for mid-size buildings such as two-stall garages, small barns, and storage buildings. Artfully engineered of durable polyethylene, cupolas add a unique finishing touch to any barn, garage, or outbuilding.